The people of Edisto have spoken and, as usual, they are at odds with each other regarding the water issue. 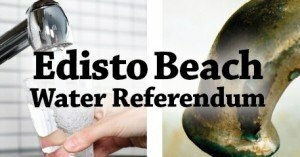 Last night the results came in from the referendum regarding the proposed $8.46 million reverse osmosis system that would mean homes on Edisto Beach could finally have drinkable water. Yes, the water that comes out of the tap is safe to drink, but it is hardly palatable and has alarmingly high levels of chemicals in it (just not high enough for any authorities to care  yet). According to talk down at town hall after the results came in, the referendum was only voted down by a handful of votes. There has been a lot of controversy regarding the water issue. A letter went out in water bills that was in favor of the reverse osmosis system. Because it was clearly choosing a side and was sent from town employees using postage paid for by the town it violates section 8-13-1347 of South Carolina State Law. Plus, it is rumored that members of town council said if the referendum were to fail that the town should shut down the free water provided at town hall. (Don’t worry, that didn’t happen). As always, drama abounds regarding the water issue, but we’ve been dealing with our salty water for so long it’s hardly a shock to the system. The only option homeowners on Edisto Beach can resort to now is a reverse osmosis system for the household. They can be costly, but at least the water coming through the pipes won’t corrode appliances and will actually taste like water. While many people are upset that the referendum was voted down, perhaps there will be another option in the future. We’ll keep you posted on any plans for the town’s water as they arise. Until then, keep taking your jugs down to town hall to get free water from the reverse osmosis system already in place. There is a limit of five gallons per household per day. funkbarton beverlyrobinson The day of the grants went by the wayside when the former ( first and 30+ year ) Town administrator retired. Edisto is not exactly diverse in its population. Grants are difficult at best. If it's condemned by the state eventually then there will be other options for monies to implement the RO. It's just that right now, in this economy, the "locals" are taxed out the ying yang. It's a tough problem, I agree. CarlEdwardKoch I will fight to my DEATh to prevent Edisto from becoming Kiawah North. And you are right, "they" will say Edisto lost it's charm. And I have said...since my teen years that people say, " Oh I LOVE Edisto! It's so wonderful! I can't wait to move there"...and then THEY are the ones that want change. I've seen it since 1974. Wanting and needing are two totally different things. Edisto doesn't need damn thing. Leave it alone. Make grits and deal with the dang water!...and yeah..I too think that salty water cures EVERYTHING that ails you too! Except, maybe, for bad attitudes. Tim O Thank you Tim O !!! !